Lawsuit alleges Better Business Bureau is a "Mafia-like racket"
The Better Business Bureau is generally regarded as a rather benign, even stuffy, non-profit that provides somewhat predictable ratings of businesses. But a Southern California law firm uses stronger language in a $200 million lawsuit, calling the BBB a "Mafia-like racket" that uses "blackmail" and "coercion" to set its "bogus ratings." The Brookstone Law Firm of Newport Beach claims the BBB "heavily favors" firms that pay to join its accreditation program, and that BBB ratings are "intentionally biased and inconsistent," according to Courthouse News Service. Brookstone says the BBB gave it an 'F' rating and revoked its "accreditation" after it refused to submit to BBB's "shakedown." The suit, filed in Los Angeles Superior Court, names the Better Business Bureau of the Southland and the Council of Better Business Bureaus, headquarted in Arlington, Va.
Brookstone describes itself as "a consumer advocacy law firm that focuses on real estate litigation, business law, criminal law, entertainment law, and intellectual property law" and alleges that the BBB downgraded its rating because it files mass joinder lawsuits, a practice some regard as controversial. A mass joinder suit is similar to a class action but instead of being a single claim brought on behalf of an entire class of clients, a mass joinder is a series of individual claims. Proponents say mass joinders serve consumers by spreading the cost of legal representation. But in a Sept. 25, 2011, article, the Los Angeles Times quoted the St. Louis Better Business Bureau as saying that mass joinders "can be just another way to separate desperate borrowers from their money -- as much as $5,000 or more in upfront fees." The St. Louis BBB had warned consumers about mass mailings from law firms that offered mass joinder suits as a way to force lenders to modify the mortgages of troubled homeowners. The BBB warning implied the suits were little more than scams. 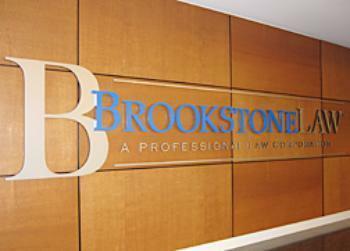 Brookstone claims the Connecticut attorney general agrees with its analysis of the BBB. "In or around November 2010, Connecticut Attorney General Richard Blumenthal criticized the BBB's letter-grade rating system as 'potentially harmful and misleading to consumers' following an extensive investigation," Brookstone says in its complaint. "Blumenthal stated: 'I find no reasonable basis for tying rating points to a membership fee -- in essence, creating what could be viewed as a 'pay to play' system, rather than a transparent and equitable 'rating' system.'" Also that year, ABC News reported that a man had received an A+ rating for his business after paying the BBB's membership fee, though the businesses he registered with the BBB did not exist, Brookstone claims, according to Courthouse News.